What's so impressive about that?? Well Pollack set a Power clean record for DEs back in 2004 at 360lbs ....Ben Watson set one back 2002 for TEs at 380lbs. Just think this just turned 17 back in Feb. Most of the highlights you see of him were when he was 15 and 16. Thanks for the suggestion. The final 10 have been done for about a month or two. I think there's some of what you requested. I'm kind of disappointed you whipped out the Erk so early. Nothing wrong with the picture today. Great caption. But definitely a letdown compared to yesterday. As much as possible the graphics are tied to the script. "New Breed of Bulldog" would be AJ. Not all of them are tied so directly. Some of the upcoming ones are just cool pics. austin - PW has already done that for today, perhaps unwittingly, but even though AJ is No. 1 in that picture, he's wearing No. 8 for the Dawgs. The first thing I thought is OMG his arms are as skinny as mine. Heroes have graced the field before you, men with hearts, bodies and minds of which the entire Bulldog nation can be justifiably proud; a tradition of unbridled excellence, demonstrated by these individuals, who many of spans more than the whole century. 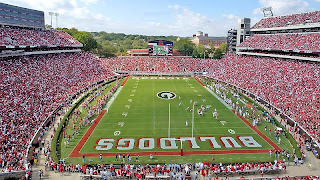 And now a new breed of Bulldog stands ready to take the field of battle, to assume the reigns of their Georgia forbearers, and continue that tradition, understanding that there is no tradition more worthy of envy, no institution worthy of such loyalty as the University of Georgia. As we prepare for another meeting on the banks of the St. John's (CUE VIDEO OF TEBOW'S FUMBLE AT SNAP LAST YEAR WHEN IT WAS OVER, OR WHEN WE STORMED THE ENDZONE, JUST TO GET URBIE'S BLOOD BOILING), let all the Bulldog faithful rally behind the men who now wear the red and black, with two words, two simple words, which express the sentiments of the entire Bulldog nation: GO DAWGS! At this point, we'd cover our noses to mask the smell of urine-stained jean shorts. . .